I’m not sure I’ve ever been great at being still. As a kid, I joined one activity after another. Not because my parents told me I should. I just liked it. Staying busy. But, I could concentrate. Quiet the mind. I’d sit and read for hours or close my eyes and listen to a cassette tape from beginning to end. Even through busy high school and college years, a good hike would help me center. But, I had to work at it. I was probably at my most mindful during a month I spent in the redwoods, practicing yoga, writing, and meditating daily (a time that my husband has playfully called my “hippie rotation”). I really started losing the stillness in medical school, and it was all downhill in residency. Wonderful in a lot of other ways, the three-year frenzy of sign-outs, check lists, and sleep deprivation that was residency put my brain on overdrive. If you weren’t moving, you were wasting time. I once clocked 17,000 steps during a single 24-hour shift (yes, our entire team wore pedometers that day). And my mind, ever seeking to understand a patient, come to a diagnosis, complete a few more tasks, moved as quickly as my steps. It’s been tough to get it to stop. The structure of primary care doesn’t help much. Ten to fifteen minutes per patient and there’s always someone waiting for you. And then there’s the cell phone and email. Even after work, I generally have this nagging sense that I should be doing something. Getting something done. Becoming a parent has affected this in both expected and surprising ways. The first year of my son’s life it mostly exaggerated this need to make lists and check off boxes and multi-serial task. Feedings, diaper changes, returning to work, pumping. . .
Over the past few months I’ve been working on being more mindful. I have a long way to go. But, I’ve noticed something interesting. My mind seems to be most quiet, most present, when I’m with my son. And, I’m at my best when we’re outside. It’s not that, as a three-year-old, he’s suddenly become still. Far from it. He explores. He plays. He runs. But, he doesn’t multi-task and he’s not thinking about the next thing he has to do. Often, when I ask him if he wants to move on to the swings or the slide he’ll say, “No mommy, I’m doing this.” One of the many things we can learn from kids. Linger a little longer. Do what you’re doing. See what you see. I’ve been thinking a lot about how I should get back to yoga, meditate more, put away the to-do list for a day. And, yeah, I should probably do all of those things. But, maybe most days a couple hours at the park would do the trick. Do you find mindfulness in unexpected places? Any tips or resources to share? 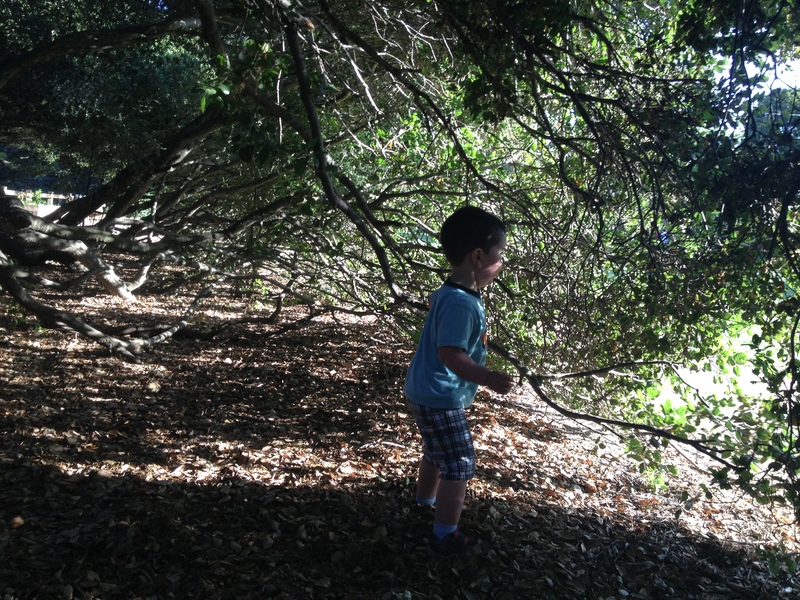 This entry was posted in Parenting and tagged mindfulness by My Two Hats. Bookmark the permalink. Wonderful post! I felt like I was reading about my own life for much of it (minus the month in the woods!). You are so right about taking the time to be “in the moment” and to just enjoy where you are at that moment in time. I, too, often feel most at peace when I’m outside with my kids, pushing my youngest on the swing set while watching the older two run around acting out their latest imaginings. Thank you for the extra time that you spend writing such wonderful posts and sharing your thoughts with the rest of us! I agree with Brooke, sounds like my own journey at the moment! Gently reminding ourselves to be present is so important until it becomes habit. Great post! Great post! I struggle with being there in the sense of truly being there as the above comments. To answer your question, I guess I think I could improve on ‘thinking’ I have to get it all done. So I’m reducing those things because I don’t really have to get it all done – then I feel I can focus on being there with the things that are on my plate. I’m not there by any means – it is something I am working on. 🙂 I enjoyed reading this! So glad you all found meaning in the post. Thanks for reading and sharing your thoughts as well. I found you on Kevin MD. Posted that article on facebook.Then found you and pinned you. I teach several Emotional Fitness Exercises, most taking only a minute or two. Here is my Be With Beauty Pinterest Board. http://pinterest.com/Emotfit/be-with-beauty/ Being with Beauty means taking a meditative breathe before and after. Thank you for this and your blog. Will be pinning more.